A brilliant piece of filmmaking that uses what goes on inside of our heads to tell us a story about what goes on inside our heads. Pixar’s Inside Out: written so impossibly well and so clear that two ten-year old boys (twins)—completely unfamiliar with the Dramatica theory of story—could easily identify two story points usually difficult to find: the Overall Story Goal and the Main Character Growth. Contrast this with a story analyst with over twenty years of experience with the theory (me) who struggled with the former, would never dare try and make a decision on the latter, and who basically spent most of the film completely awestruck at the level of artistry involved with the animation. 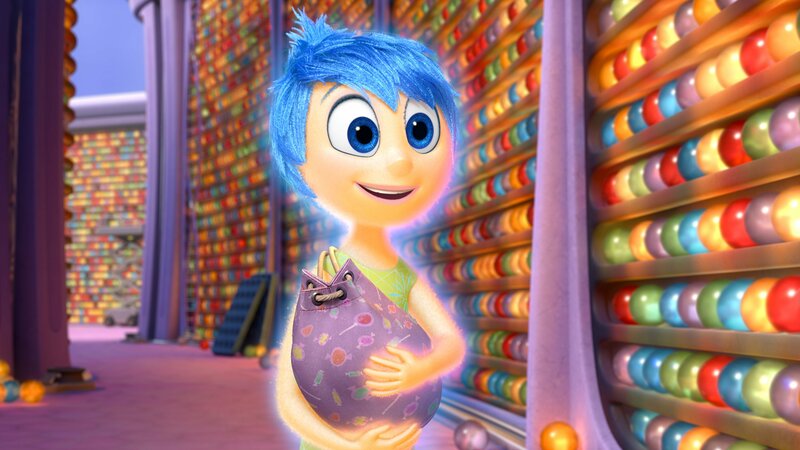 To say Inside Out is a great story is an understatement. In a time when a lot of feature films stray from meaningful narrative, it is nice to see that someone still cares. Before getting into the deep analysis presented by my children, I do have to mention perhaps the most obvious Optionlock Story Limit in the history of storytelling: the five islands of Riley’s personality. Typically the Story Limit can be a difficult and often obscured point to define. Here, not so much. As the islands fall into the abyss we the Audience know that the climax is rapidly approaching. We know the scope of the story and we know when it will end. This is the purpose of the Story Limit. From now on these islands will be the penultimate expression of an Optionlock. The Overall Story Goal is the point of resolution all the characters in the story are focused on. This includes Joy, and Sadness, and Anger and Fear and Disgust and mom and dad and everyone else—including Riley. The Overall Story Throughline takes an objective look at everyone’s conflict. When asked the Story Outcome of Inside Out—did the film end in Success or Failure—the unanimous answer from my children was Success. When asked what the Goal of the story was, i.e. why it was a Success, one of my twin sons (the autistic one) answered back, They figured out you can’t be happy without being sad. I had been contemplating an Overall Story Throughline in Psychology and this answer pretty much sealed the deal for me. Figuring Out You Can’t Be Happy without Being Sad is a wonderful StoryEncoding for an Overall Story Goal of Conceptualizing. Typically a difficult narrative Type to understand, Conceptualizing can also be thought of as Developing a Plan. Certainly Joy—along with many of the other characters—feel like they know best how to manipulate Riley. Anger goes so far as to pull a light bulb out and shove it into the control console in an attempt to give Riley the idea of running away. Conceiving an Idea is another narrative Type that works alongside Conceptualizing and sits under the umbrella of Psychology along with Being and Becoming.2 All four of these Types function as Acts within the narrative and it is safe to say that these are an excellent representation of the kind of major conflict going on between all the characters. As we continued to do our own family analysis, everyone agreed that Joy ended up in a better place (Story Judgment of Good) and that she was the kind of character who preferred to take action first before trying to change herself (Main Character Approach of Do-er). Be-er’s are the kind of characters who prefer to change themselves first before taking action, and this really didn’t sound like Joy at all. They also unanimously agreed that Joy Changed her Main Character Resolve (instead of Remaining Steadfast). But when it came to the other half of Joy’s “character arc”—the Main Character Growth—most of them clammed up. The Main Character Growth asks whether the Main Character grew to the point where they could change their resolve because they Stopped something or because they Started something. Most of the time I leave this Story Point to Dramatica (If you make another decisions on Story Points, Dramatica will actually tell you whether or not your Main Character is a Stop or Start character. It’s magic and worth seeing in person. ), though occasionally I’ll make a guess as to what I think it is and hope that it turns up like that in the end. My other ten year old son (the mildly autistic one) didn’t hestitate to answer. “She needed to start letting other emotions in.” Another proud moment for this father. Stop characters are often told as characters with chips on their shoulders. Start characters are often displayed as characters with holes in their hearts. Now, while Joy is not the kind of heartless sonofabitch you typically find in this position (like Rick in Casablanca or William Munny in Unforgiven), she did have a hole in her understanding of the importance of certain emotions. Starting to see the importance of these moved her to the point where she could finally Change and allow sadness in. Dramatica works because it is a theory of story built on psychology, not on collected data and repeated analysis of film. Storytelling is instinctive and practiced by children from an early age. The Story Points classified by Dramatica are intuitively known by anyone who has ever tried to tell a story; they don’t require Master’s degrees or dissertations because they’re simply known. When a film connects on a deeper level, it is connecting because it is honoring this intuitive understanding every Audience member is intimately familiar with. Pixar has an insane track record of writing complete narratives. While there have been missteps in recent years, the core group—those who get story and perhaps even know a little bit of Dramatica themselves—continue to affect us by tapping into that collective understanding we all share. Inside Out tells us a brilliant story of what goes on inside of our heads by using what goes on inside of our heads to tell it.